Presenting AppByte - The Drag and Drop Website builder. Coding was a key part of building great websites. Not anymore! Now create app-like and mobile-ready websites without any coding! 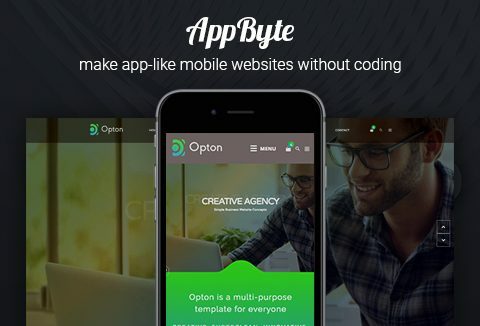 Any website under the sun with any complicated features... AppByte can handle it all. Try it out. 30-day money back guarantee! Grab this deal for just $49.99! Custom Domain: You can assign your own custom domain to your mobile website! Analytics: You can monitor the visits to your mobile website, where they are located, what device they used, and more! Widget Data: View the submissions of the forms, including contact us forms. App Users: Get information about your mobile website users. You will have to create an account on AppByte website and redeem a special coupon which you will receive after purchase. Each account allows you to create an unlimited amount of creations. You may use the websites created with the tool for commercial use. You may not share access to other users.